One of my top priorities for our home life and homeschooling in the past year has been to teach my children how to study the Bible on their own and for themselves. I did not come to give my life to the Lord until I was in my twenties. Studying the word wasn’t at all a part of my child and in all honesty, I still struggle with it today at age 40. I don’t feel competent. I want something different for my children. This world grows ever more hostile toward our faith and I know if they are to have any chance to walk closely with Jesus all of their lives they are going to need to know how to go to His word on their own. 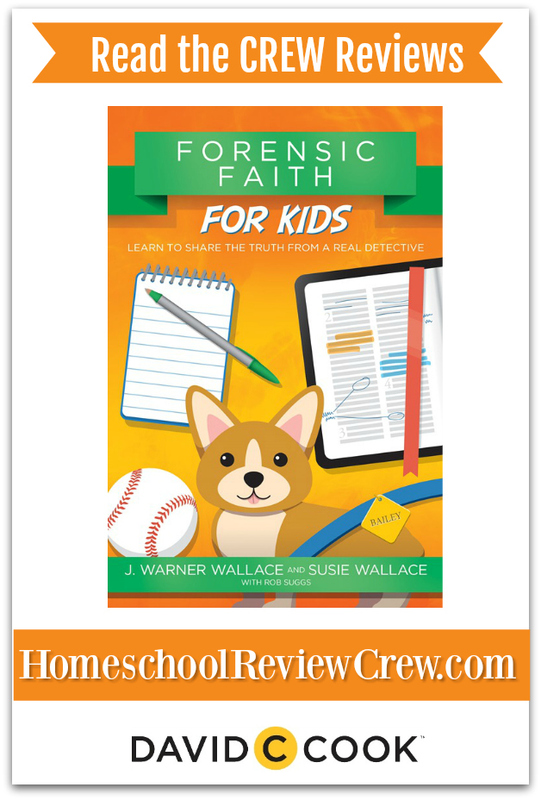 For the past several weeks we have been learning how to be detectives with the Case Makers Academy“s Forensic Faith for Kids provided by David C Cook. This book is really appealing to children who enjoy the idea of being a detective. I have two children (age 8 and 10) with that sort of spirit and they both adored this book and read it cover to cover. The reader plays the part of a student at a detective academy who is being taught by a police detective. He teaches the reader how to use true detective techniques that apply to a lot of different situations including how to apply those detective reasoning skills to faith questions. In this book, the student detectives have a friend who is questioning the Gospel story. All of these detectives in training want to help their friend answer their questions but they don’t really know how. As the story progresses the teacher detective teaches the students through the mystery of a missing puppy, and… conveniently, how to search for evidence of the Gospel. The book has something of a unique setup and can be read aloud almost like a little play. There is the part of the narrator and then the characters. They could be a great family read aloud. You’ll also find sidebars that will define terms or make a scripture verse stand out. They help to improve understanding. While this whole book is something of a fictional story, I love the actual practical strategies that are taught through the directions from the teacher detective and the actions of the students. For example, they go seek the advice of a pastor. They learn a new method for taking notes while reading the Bible. They turn to scripture to find real evidence. They study together and even pray. I love the things that the kids do to prove this – they go to a pastor for help, where they learn a note-taking technique to use with their Bible reading; they look to scripture for evidence; they study and pray and share their findings with each other. I love this! The kids in the book take practical steps to solve their problem and learn how to study their Bibles, and this is a great example for our own kids. With each step wrapped in detective terminology, it feels professional in a fun way, but each one is legitimate, practical advice that can be used by anyone of any age. I want to draw your attention to another resource that accompanies the book. You absolutely have to check out the Case Makers Academy website. You’ll find so nan videos and printables to accompany the book and bring your study to a much bigger level. Every chapter has an accompanying video with activity sheets, notebooking sheets, and a guide for you the teacher. What a gold mine these resources really are. They might make a great study for your co-op, youth group, or other similar class settings. This series of books and accompanying website are fantastic. I think this is a resource my family will return again. My children enjoyed it immensely and we had some wonderful conversations. I’d even say our relationships with God certainly benefited.